The beautiful and idyllic Hawk’s Flight Farm is located on the Gulf Coast of Florida in Sarasota, a place famed for Siesta Key Beach, five-star restaurants, world-class shopping venues. 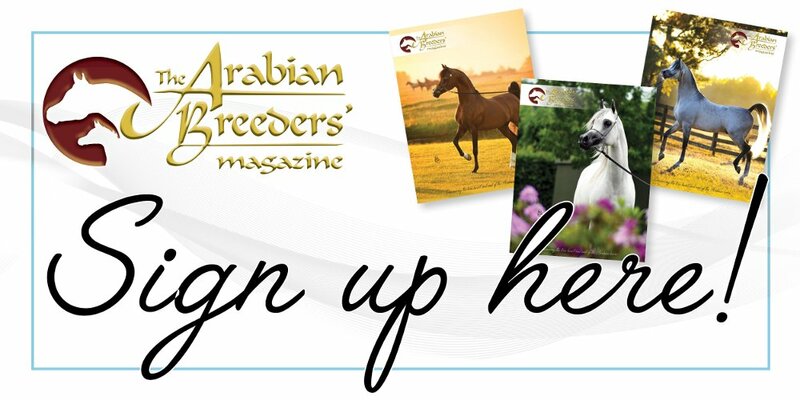 It is here that Karin McMurtrie’s unique breeding farm of Arabian horses can be found. Fast approaching 40 years of breeding, the horses of Hawks Flight Farm can be found the world over, and they excel in both halter and performance, as well as in the breeding barn. 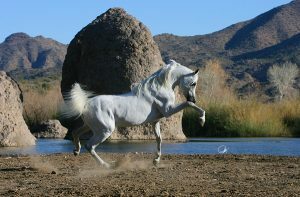 Having already been in love with Arabian horses for many years through her stallion Cal Daaba (RS Dalimage x Cal Kristaba), Karin then sought a stallion who would combine athletic ability with Arabian type. 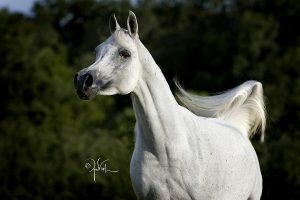 Her love for the lines of Ali Jamaal (Ruminaja Ali x Heritage Memory) and El Shaklan (Shaker El Masri x Estopa) led her to the incredible stallion, Amir Jamaal (Ali Jamaal x Luz de Fe by El Shaklan), and the stage was set. What followed was beginning of the Hawks Flight Farm breeding programme in earnest. 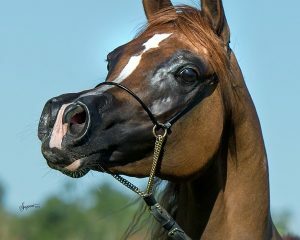 Amir Jamaal (Ali Jamaal x Luz de Fe by El Shaklan). Credit Javan. “In 1999, Amir Jamaal’s first foals out of my mares were born,” recalls Karin. “The first was a grey filly out of GF Exquisite (Mark Al Badi x GF Jabrina), born at sunset. 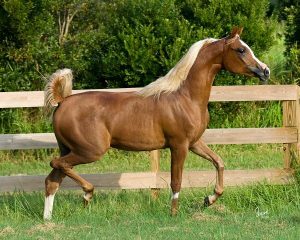 I will never forget the sight of that foal – tiny muzzle, huge eyes, small, well-shaped ears, and a beautiful balanced body; I cried at her perfection and knew that Amir Jamaal was going to be a great breeding stallion for us. 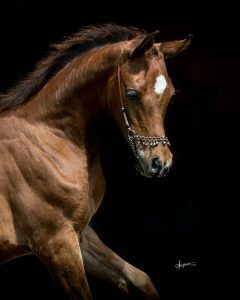 HF Diva Jamaal (Amir Jamaal x GF Exquisite by Mark Al Badi). Credit April Visel. HF Lady Snickers (Amir Jamaal x Lady Godiva by Padrons Psyche). Credit Suzanne. HF Charm Bracelet (Ames Charisma x HF Diva Jamaal). Credit Suzanne. HF Lady Stelleta (Elite AF x HF Lady Snickers). Credit Suzanne. Amir Jamaal 1992 – 2017. Credit Gigi Grasso. Life, however, goes on, and Karin had already sought a new line to bring fresh blood into the Hawks Flight Farm programme. 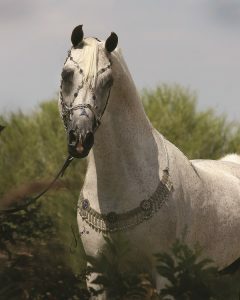 This was found through Prince Michael MPE, a son of WH Justice (Magnum Psyche x Vona Sher-Renea) and out of the ethereal grey beauty, Thee Rahiba (BJ Thee Mustafa x HMT Farima). On lease from Haras JM in Italy, Karin is eagerly awaiting Prince Michael’s first foals – foals that will cross the older lines of Amir Jamaal with the future. “Prince Michael has given me excitement back as a breeder,” says Karin. “After Amir’s passing, I wasn’t sure how I could carry on but I knew I had to. Michael has given me that hope for the future at Hawks Flight Farm. Our mares expecting Michael foals are Lady Godivaa (Padrons Psyche x Lady Larissa) and her Amir Jamaal daughter, HF Lady Snickers; HF Psyquoia (Psymadre x Shahlimar Bey); and PGN Zimazing Grace (Shah Azim x Midnightemptation). It is a wonderful range of internationally appealing bloodlines. 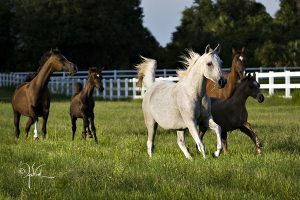 Mares and foals at Hawks Flight Farm. Credit April Visel.